The 79th Annual Dinner of The Marine Club takes place in Toronto, Ontario at the Fairmont Royal York Hotel’s Canadian Room. The Guest speaker is Rear-Admiral Couturier. Rear-Admiral Couturier joined the Navy in 1983 and has served in ships of both the east and west coast fleets. Rear-Admiral Couturier commanded HMCS FREDERICTON. In 2006 he deployed to the coast of Africa for Operation CHABANEL, a RCMP operation that resulted in the seizure of 22.5 tonnes of hashish bound for the east coast of Canada. Rear-Admiral Couturier was the Maritime Component Commander for the navy’s support to the RCMP-led Integrated Security organization during the Vancouver 2010 Olympics. After he was assigned to US Central Command in Tampa, Florida for two years. During the summer of 2014 Rear-Admiral Couturier performed the duties of Maritime Component Commander for RIMPAC 2014, the largest maritime exercise in the world that took place off the coast of Hawaii and included 22 nations, 47 ships and over 20,000 participants. 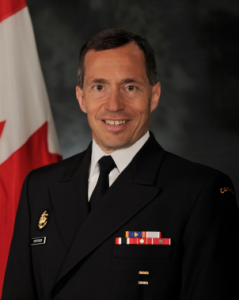 He returned to Esquimalt and assumed command of the West Coast Navy from summer 2015 to 2016. Rear-Admiral Couturier still has a passion for our national sport and attempts to put the blades on as often as he can. He also enjoys a run along the Rideau Canal at a pace that allows many to follow. Le contre-amiral Couturier s’enrôle dans la Marine en 1986 après ses études aux HEC Montréal. Commandant du navire Canadien de Sa Majesté FREDERICTON en 2006, il est déployé au large de la côte africaine dans le cadre de l’opération CHABANEL, une opération de la GRC qui entraîne la saisie de 22,5 tonnes de hachisch à destination de la côte Est du Canada. Un passionné de notre sport national, il chausse les patins le plus souvent possible. Il aime également courir sur le sentier adjacent au Canal Rideau, à un rythme qui permet à beaucoup de coureurs de le suivre.